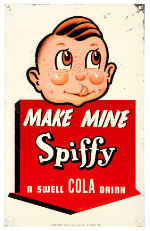 Striving to be world famous and quite swell since 1934, Spiffy delights the senses with the refreshing and invigorating taste of cola. The rich caramel cola flavor you love with just a hint of lemon and no aftertaste. Enjoy an ice cold one today.